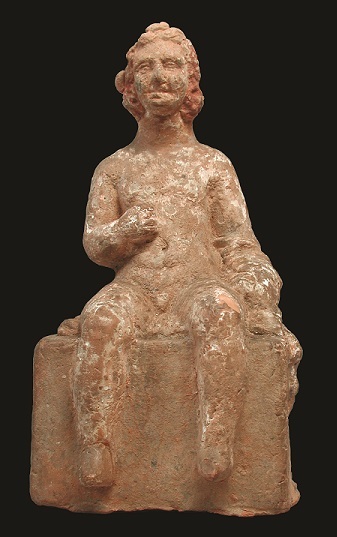 Description: Charming example of a popular type of terracotta figurine of a boy seated on a square bench with a bag of knucklebones in his hand. 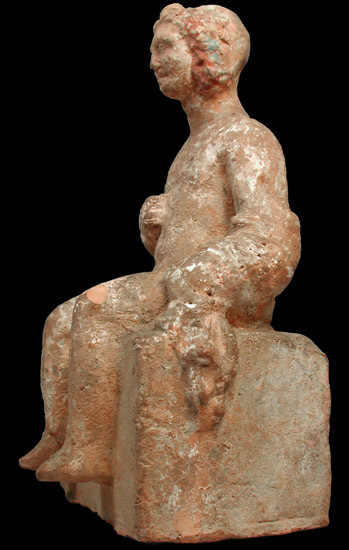 The youth is naked except for a cloak draped across his left arm. He wears a tight cap over his curly hair that frames his face and incised eyes, broad nose and full lips. Hollow made from fine pink-orange clay with remains of white, pink, blue and brown polychromy. Condition: Good overall condition, abrasion to the knee and head reattached. 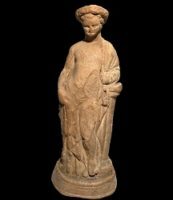 Provenance: The terracotta was formerly a British property. Also, once Christies London. 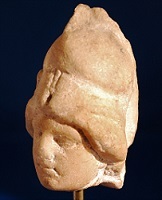 Reference: See Reynold Higgins, Tanagra and the Figurines, #188, for a related type from Tanagra.